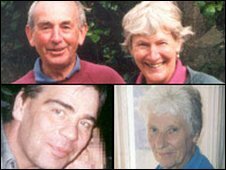 A mental health patient who murdered four people was "not treated successfully", an independent inquiry into his care has found. But the report into the care of serial killer Daniel Gonzalez said there was nothing to suggest his potential for violence was overlooked. Gonzalez, of Woking, Surrey, was given two life sentences for the murder of two men and two women in 2004. 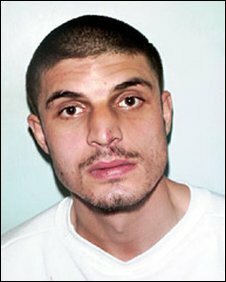 The 27-year-old was found dead at Broadmoor Hospital in 2007. After the report was published, Gonzalez' family issued a statement which said: "We hope very much that the recommendations are acted upon so no-one else suffers in the way the victims and their families have." Lucy Scott Moncrieff, author of the report commissioned by NHS South East Coast and Surrey County Council, said that overall Gonzales was not treated successfully. She said Gonzalez was one of an identified group of users that were difficult to engage - mentally-ill young men involved in drugs and petty crime. Most were not violent, but a small number of schizophrenics who committed homicide did have that profile, she added. She said helping them was "an urgent priority". Fiona Edwards, chief executive of Surrey and Borders Partnership NHS, apologised to the families of both Gonzalez and his victims. She said: "We welcome the report's findings, which support our own investigations, that there was nothing to suggest that evidence of Mr Gonzalez' potential for violence was overlooked. "However, that does not mean we cannot learn from these dreadful events." Marjorie Wallace, of mental health charity Sane, said: "It is nothing short of a scandal that a young man was allowed, over eight years, to be failed time and again." She said everyone involved in mental health care should read the recommendations and learn that if they did not respond to pleas for help and warnings from families, they were putting lives at risk. Gonzalez was diagnosed as suffering from schizophrenia in 1998 and carried out the random killings over three days in September 2004. His victims were Derek and Jean Robinson, 76 and 68, of Highgate, London; Kevin Molloy, 46, who was attacked in Tottenham, London; and Marie Harding, 73, who was murdered near Worthing, Sussex. Two men who survived attacks by Gonzalez were Peter King, 61, who was knifed in Portsmouth, Hampshire; and Koumis Constantinou, 59, who was attacked in north London. In 2006, the Old Bailey heard that Gonzalez had wondered what it would be like to be Freddy Krueger, from the Nightmare on Elm Street horror films, for a day.